Starting March 28 (for six weeks onward), Thandiwe Shiphrah will offer her class, “Gathering Courage: Still-doing, Big Journaling, and Other (Not So Scary) Ways to Begin Accommodating the Soul” as an online class through the TLA Network. She writes of the class, “Each session presents a nourishing opportunity to honor who you are and what you value, to acknowledge and share your unique talents, and to make a commitment to your creativity. This is a time for dreaming, writing, setting intentions, planning, shifting, rethinking (as in changing direction) or getting your nerve up in preparation for taking leaps or stepping out on faith. Ideal for artists, writers, activists, innovators and entrepreneurs in any field.” Listen to what else she has to say about this class, gathering courage, and living more in tune with the soul. Caryn Mirriam-Goldberg: You call this class, “Gathering Courage: Still-Doing, Big Journaling and Other (Not So Scary) Ways to Begin to Accommodate the Soul,” which is like a poem unto itself. What does gathering courage look like to you, how does it relate to living more soulfully, and how do you see the value and benefits of accommodating the soul”? Thandiwe Shiphrah: Gathering courage is about cultivating and sustaining positive energy around one’s hopes, dreams, and aspirations and acting in small ways that bring joy and fulfillment. I think of it as getting your nerve up to do the big thing that scares you. Gathering courage emboldens you to live more soulfully because it helps you gain clarity about what you want to do and about how your talents and skills would be best utilized to accomplish goals and objectives. It is also about discovering what’s been holding you back and developing strategies for “ease dropping on your brain” so that you can correct ideas, attitudes, and beliefs that keep you from living life fully. CMG: When did, to take a topic from your class, “the call to create” come to you, and how are you conversing with that calling these days? Did you grow up making art, and how has that evolved over time? TS: When I was growing up, I made art all the time. I just didn’t call myself an artist. I wrote my first poem in elementary school and I performed in school plays all through middle school and high school. I also dabbled in portraiture by making charcoal and pastel drawings of my friends and family members. One early call to create came in the late 80s when I wrote and produced my first poem play. Later, I co-founded an ongoing performance group called The Word Up Poetry Ensemble. We performed in community-based settings (churches, community centers, schools) and our shows typically featured a combination of original works by the 7 group members – we were all budding poets and/or musicians – and works by famous African American writers such as James Weldon Johnson and Maya Angelou. 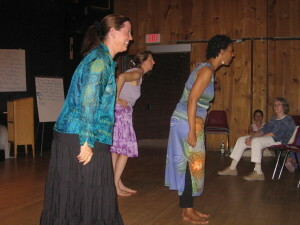 I loved interpreting other people’s poetry and I loved performing as a group. These days I am delving deeper into poetry’s capacity to inspire creativity in other disciplines, an area I’ve been exploring for more than a decade. I recently collaborated with a group of women engineers and we are looking at ways that poem-making and storytelling can inspire creativity in engineering and encourage more women and girls to enter STEM fields. My artistic practice has evolved over the years to encompass writing for print as well as performance, creating visual art exhibits and installations, composing “audio collages” with my husband, musician/composer Daniel Arite, and developing and implementing community arts programs in partnership with churches and non-profit arts organizations. 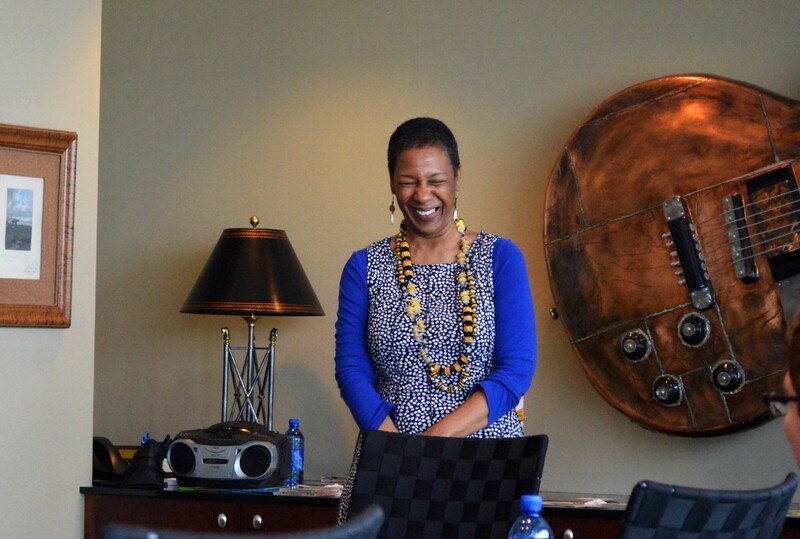 Last year, in my capacity as director of literary arts and community engagement at Nashville’s Global Education Center, I co-produced a city-wide conversation on the healing aspects of the arts that included local and internationally known writers and healing arts practitioners. It was a tremendous creative challenge and very rewarding (see here). CMG: When I met you at the Power of Words conference many years ago, you were already a powerful and meaningful long-time multidisciplinary artist who wove together the arts, health and healing, and community. In a world where we’re supposed to choose one vocation and/or avocation to be or do, what led you to be and do many? TS: I see myself as engaged in only one vocation: I am an artist. Because I grew up drawing, acting, and writing, I never felt like I had to choose one way to express myself artistically nor have I found a compelling reason to limit my art to one subject matter or field of study. I believe the arts can inform and enrich all aspects of our lives and my tendency to work across disciplines stems from this belief, as do my explorations into the restorative and community building aspects of art making. I enjoy finding creative ways to highlight how the arts — particularly poetry—can be used for personal development and social transformation. This leads me in a lot of different directions. CMG: You talk about “deeper listening” as part of this class. How can people cultivate a greater capacity to hear themselves and the world? TS: The practice that I call Still Doing is a combination of self-inquiry and reflection that involves listening and responding to specific music as a means of getting in touch with our feelings and deepest desires. If you engage in Still Doing consistently, you will begin to feel more connected to yourself and to the world. Meditating on qualities such as joy, grace, gratitude can also bring about a greater degree of self-awareness. CMG: What can people expect to experience in “Gathering Courage”? TS: People can expect to be simultaneously challenged and encouraged by the assignments and journal exercises. They will come to a greater appreciation for their life learnings and they will develop more confidence in their creative capacities. They will feel inspired to create opportunities to draw from their experiences and use their unique talents and skills. And they will have fun! Thandiwe Shiphrah is a multidisciplinary artist, an independent curator of community arts programs, and a writer and producer of performance events. For the past 25 years, she has been passionately exploring the link between the arts, personal life enrichment, and healthy community development, with a focus on cross-cultural communication and social inclusion of marginalized groups. Her poetry and mixed-media art have appeared in numerous journals, anthologies, and magazines. For more information, watch this video of Thandiwe. See more here. Facebook page for this event is here. ← Chrysalis: A Journal of TLA Welcomes Your Creations Now!